Children enjoy using crayons to create colorful artwork. 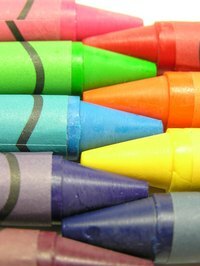 The crayons often become broken, neglected or unappealing to children. Instead of throwing the crayons away, you can melt them down to create new crayons. Cookie-cutter crayons allow you to create new and fun shapes. Making cookie-cutter crayons will require the supervision and help of an adult due to the dangers involved in melting the crayon wax. Remove the labels or paper stickers from the old crayons. Break the crayons into small pieces. Sort them by color. Line your work area with old newspapers. Place each separated group of crayons into a tin can. Fill a small saucepan with water and bring it to a boil. Reduce the heat to the medium setting. Place the tin cans filled with the crayons in the water. Stir the wax as it melts to blend the crayons together. Place the cookie cutters on a flat surface. Place newspaper, waxed paper or aluminum foil under the cookie cutters. Hold the cookie cutters in place. Pour the melted crayon wax into the cookie cutters carefully to avoid burning your hand. Allow them to cool completely. Pop the molded crayons out of the cookie cutters. Place the cookie cutter in the freezer for 10 minutes if you have difficulty removing the crayon. Do not leave the hot wax unattended. Use an oven mitt to pour the candle wax because the tin can will be hot.